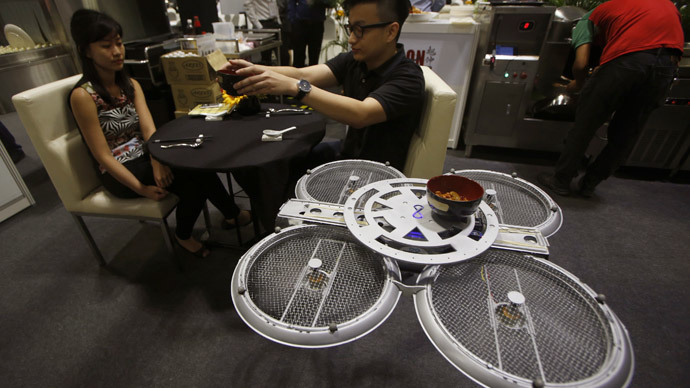 In a separate news report, I was heartened to read in CNA that WDA and SPRING Singapore will start a “Delivering Luxurious Service” masterclass for the retail, F&B and hospitality sectors. Such a move will hopefully improve the customer experience, encourage repeat patronage, trigger positive word-of-mouth, increase revenue, and boost productivity. Beyond these measures, I have suggested quite a few more. They include understanding the basics of productivity, embracing the 6 Ts of productivity improvement, adopting 4 process improvement tools, and boosting the productivity of SME retailers. These efforts require a systematic, holistic and design-thinking approach to overhauling productivity. And yes, I am passionate about this topic, having spent 4 years of my life at SPRING. As you can see, we are definitely not lacking in solutions. In fact, the Government has been very generous with incentives to nudge companies, businesses and individuals to strengthen processes, invest in good design, upgrade skills, automate and mechanize. Yet somehow we fail to slay the unproductive beast. I believe the heart of the problem lies in our hearts. Or more specifically, what motivates and inspires us at work. Have a look at the chart below (courtesy of drawpack). 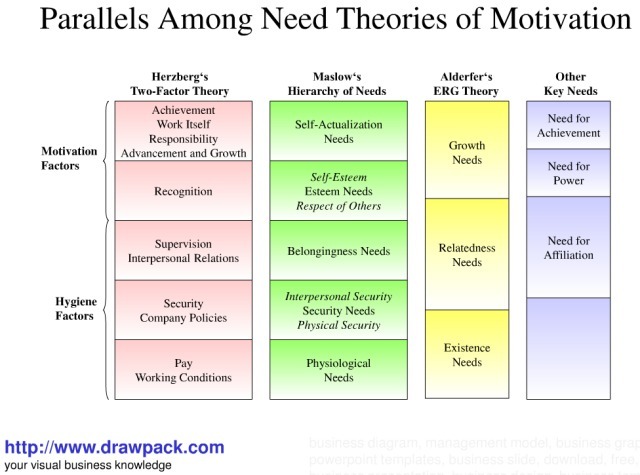 According to the chart, there are parallels between the most universally accepted motivational theories. These are Herzberg’s Two-Factor Theory, Maslow’s Hierarchy of Needs, and Alderfer’s ERG Theory. More recent ones like Dan Pink’s ideas on Autonomy, Mastery and Purpose (see What Truly Motivates Us) are also predicated on similar drivers of motivation. To succeed, productivity measures must first tackle the hygiene factors. In other words, things like working condition, pay, security, health and safety, flexibility and so on. However, these are not enough. People are truly motivated when their motivation factors are achieved. They include recognition, respect of others, a sense of achievement and advancement, power, autonomy and mastery, and self-actualisation. If you can’t lick the motivation problem, any productivity measure which you introduce will fall flat on its face. What Do Workers Think About “Productivity”? Let us pause further for a moment and ask ourselves this question. What is the first thing which comes to mind when your boss asks you to be more productive? While it is good for us to be optimistic, the reality is that many workers aren’t motivated by “productivity”. In their minds, it equates to “doing more with less”, “squeezing blood from stone” and other management mantras which imply that you are not pulling your weight, or a non team-player. Of course, not everybody thinks this way. Highly motivated workers – those in the top 20% of the bell curve – will challenge themselves to be more productive when nudged to do so. However, these tend to be the minority (otherwise our productivity would have risen a long time ago!). Which brings us to the billion dollar question. How Do We Motivate Workers To Be More Productive? To address the issues above, here are some preliminary thoughts. Some are short term measures. Others are long term goals that require major shifts in our society. These days, it isn’t uncommon for workers in the retail and service industry to be promoted barely a year or two years into their job. This is a necessity due to the high turnover rates of these sectors. Often, these newly promoted managers and supervisors are the top performers. Unfortunately, many of these young managers are not adequately trained to lead and manage people. Eager to impress, they may ride roughshod over their charges. To remedy this, it is important for companies to weave in soft skill and leadership training for new managers. Where possible, inculcate leadership values like empathy, humility, and patience to smoothen the hard knocks of the workplace. This would only be possible through a major shift in our culture. Instead of threatening our kids that they would “throw rubbish” or “wait on tables” if they fail to excel in their studies, we need to encourage them to respect vocational professions. This would also come through showing appreciation for and being friendly to everybody who has a decent job. I love what my former Chairman of NHB Professor Tommy Koh used to do whenever we have an official dinner at a restaurant. He would make it a point to acknowledge the chefs involved in preparing the meal and to lead the table of guests in applauding them publicly. Such graciousness would motivate far more than all the money in the world. Gamification is the process of using game mechanics and design to achieve certain objectives. At the workplace, it can be used as a tool to make work feel like play. You read my blog post The Gamification of Work to get a grasp of how this could work. The best example of a fun workplace is probably Zappos. Read how Tony Hsieh “delivered happiness” by Zooming in on Zappos. Nothing kills productivity more than rapid staff turnover. High staff turnover leads to poorer customer service and lower productivity as new hires will need some time to learn the ropes. And the number one reason for people leaving a job? A negative and toxic work environment (here are 10 signs of such a workplace). The final step to humanize our workplaces is to make it easy for employees to be spontaneous and innovative (without going overboard of course). Instead of leaving their heart at home and bringing only their soulless, emotionless selves to work, nudge them to break out of their shell. Devise ways to encourage employees to do little things to improve their work environment and processes, but don’t kill them with documenting and reporting it! While I am an advocate for measurement, I also realise that the drudgery of compiling 10 page “innovation reports” may sometimes hinder the very innovation itself. Not every good deed (or bad deed) needs to be captured – we are not Santa Claus! Are there other ideas you have on how we can improve motivation (and hence productivity) at workplaces in Singapore? I’d love to hear them.